On our original itinerary we visit Galle next day after Mirrissa on the way to Bentota, but both my colleague, Rob, and I found this historical city of Galle rather delightful, full of history, colour and texture very different to other Sri Lankan towns that we had visited. The old town within the fort is full of decaying Dutch colonial buildings, and full of boutique shops, cafes and lovely hotels along the narrow lanes and gravel paths. 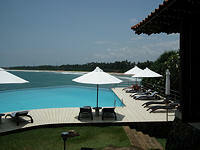 Arriving in Bentota, we visited the Saman Villas. This is a very luxurious resort that we are using in our special hotel category. For people looking for relaxation, peaceful surroundings this is the ultimate luxury. Honeymoon couples would find it especially suitable. There are superior rooms on the first floor with lovely private terrace balconies looking over to the sea on horizon. Guests can enjoy their breakfast or dinner here for privacy and the unspoilt sea view. The room is large and split level, divided into sitting area at the entrance with sofa and chairs and the raised bedroom area. The lovely bathroom has outside bathing and showering at the back with high walls for privacy. The ground floor rooms are deluxe rooms with patio and lawn, although the room is the same. There are also rooms with private plunge pools and suites too. The hotel is built on a headland with beaches to the North and South sides. By walking a few steps down on either side you are on miles of sandy beach and the warm sea. Although there are no private beaches in Sri Lanka the beach on either side looks quite deserted with few people and traders. Of course there is also a large and wonderful infinity pool. I would want to come back next time as a guest myself. 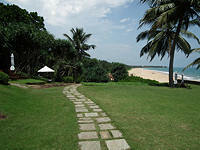 We also inspected another resort that we use for our superior hotels category, the Bentota Beach hotel. Designed by a well known Sri-Lankan architect, the most spectacular feature in this hotel is the large inner courtyard with small islands of trees and greenery floating on the pond. The large hotel grounds are covered by beautiful gardens with palm trees, green lawns and flower bushes. The hotel has a large swimming pool in the garden leading to the sandy beach at the end. The river passing through the town to the sea can be seen at the side of the hotel. All rooms are large and beautifully decorated in local style. We are happy to carry on using this resort for our superior hotels category. Afterwards we checked in at Cinnamon Bey for our beach resort stay of three nights. 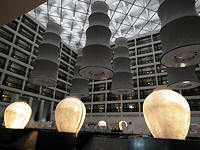 We use this hotel in our deluxe hotels category. The first impression of this hotel is one of size. The entrance and reception area is very large, as is the main buffet restaurant (there are 3 other smaller restaurants), the swimming pool is also enormous (there is a second one which is smaller and a childrens pool) and the rooms are a good size too. This is a big hotel. The mile long sandy beach is right at the end of the hotel garden. Like all other Cinnamon hotels the food at breakfast and dinner buffet is very good with a good selection of local curry dishes and international food. We relaxed and enjoyed our three nights there. For the original 14 day itinerary we would have stayed for 4 nights at the beach and depart to Colombo with a city tour before transferring to the airport for the flight to UK, but instead we drove to Colombo on day 13 to take a city tour and see more hotels in the city. Colombo is a small city, the main areas to interest travellers being the fort area,the Old Dutch Hospital which is now a shops and cafes courtyard market, St Peter’s Church and Hindu Temple. Our first hotel to inspect in Colombo was the Cinnamon City hotel,a large 5* city style hotel with marble floors throughout the hotel lobby. There are two wings to the hotel with different styles, colours and décor to separate them. The hotel garden is beautifully lush and full of trees and greenery, unusual for a city hotel. All rooms are large with modern décor. This will be our deluxe hotel offer for clients who wish to stay in Colombo. The Galle Face Hotel is the 'Grande Dame' of Columbo. The grandeur of yesteryear can still be seen through the sweeping stairways, high ceilings, antique furnishings, elegant table lamps, shiny marble floors and the many chandeliers in the hotel lobby. The stunning hotel swimming pool with sunbeds and parasols rises above the sandy beach and the sea below. The hotel suite room has the best view of the ocean right in front of the suite balcony. The hotel is under renovation at present, with one wing closed, but will soon be restored to former glory and we will be using this hotel in our special hotels category for anyone who is interested colonial period type hotels. We checked in at 4* Galadari hotel. This is the hotel we are going to use for our superior hotels category in Colombo. This is a good conventional hotel in a excellent location with the beach and sea across the other side of the road and shops and restaurants nearby. Our room has a fantastic view of the sea. The best of this hotel is the evening buffet dinner. We had the best seafood dishes of our 14 days trip. There were prawns, tuna, salmon and many other different types of fish. The most memorable dish was the mix seafood of about 5-6 different types of seafood cooked in butter sauce. We enjoyed our trip. 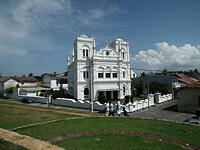 We are going to revise our 14 days Sri Lanka Ancient and Morden itinerary to make it a more balanced trip. We are also adding several more tours like 14 day Safari, 14 day city and beach and a Sri Lanka Deluxe itinerary using luxurious, colonial or unique hotels allowing clients to enjoy and see the past and present of Sri Lanka.